Last week I wrote a guest blog for the Leeds Inspired website about what we uncovered at the Alice In Bloomers research day that was held in Morley Library with Morley Community Archives. Do visit the blog to share our findings and, if you’re interested, come along to the discussion drop in or writing workshop which will be held next Tuesday (details below). Throughout the research and development phase, I will conduct a series of interviews with the artists involved. The first artist in the chair is freelance costume maker and seamstress Allana Marsh. Allana studied Costume Construction (Foundation Degree) at the University of Glamorgan and at Northern College of Costume. 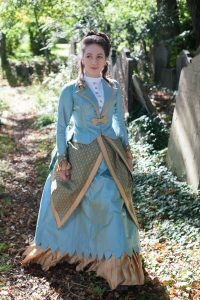 She has worked on theatre shows including Cameron Mackintosh’s ‘The Phantom of the Opera’ and makes bespoke garments for entertainers, performers, art galleries and historical re-enactment. Allana’s brief for Alice In Bloomers is to design and create costumes inspired by the Alice Cliff Scatcherd scrapbook. She will also be involved in prepping, installing and de-installing one of the exhibitions. 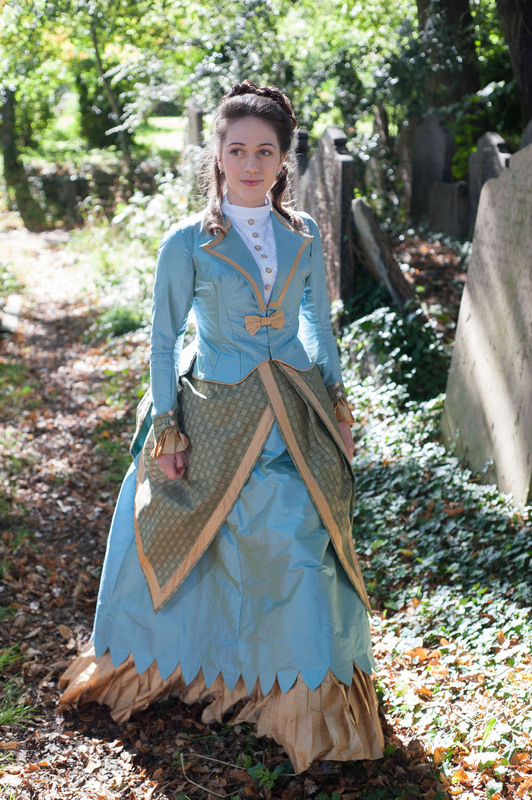 What do you find most exciting about re-creating Victorian fashion? The elements I find most exciting are how the clothing makes people feel. How you dress has a huge effect on your behaviour and emotions. We can never experience the way in which those women felt as they lived in such a strict moral climate but, as you wear the clothes, you feel like a piece of history coming to life. It is living the history rather than looking at it as an outsider or analysing it. You can feel it and that is much more exciting than anything you find to look at in a museum. To what extent does fashion link with politics? Society didn’t approve of women having strong political views – they were seen to have a more ‘decorative’ role of wife and mother. But where it was difficult for women to make a statement verbally, she could do it much more easily with a ‘visual statement’ – fashion. Creating attention and ensuring that you were noticed made people listen. A woman who cared about how she looks and dressed ‘morally’ must talk more sensibly than one who looked shocking. Equally many political women were seen as ‘drab’ as they felt that they couldn’t be taken seriously if they were attractive rather than plain. Trying to compete with a man was never easy when wearing a skirt. What would you have refused to wear if you were born in the same era as Alice? 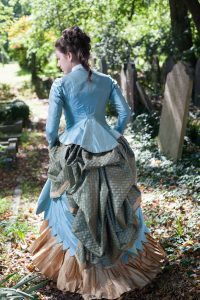 The hobble skirt – they had an extremely narrow hem that impeded the wearer’s stride and often worn with a knee- length corset. Being unable to walk properly is much more frustrating and restraining than a corset which I find comfortable and supportive (perhaps only for a short time). Luckily the hobble skirt was a short lived fashion trend, I can’t imagine many women putting up with it! I’d like to learn more about Alice’s fashion choices. How did she use her clothing to portray her character and political views? Was she still an accepted member of middle class society while pushing the boundaries? And to what level did she turn her back against the strict dress codes that directly reflected Victorian morality? 10am-12pm Drop in to view the Alice Cliff Scatcherd scrapbook and examples of Victorian costumes. Bring your knowledge of Morley, photographs of the period and/or an enquiring mind. 1-3.30pm Write about real and fictional women, creating strong female characters and finding their stories in a creative writing workshop that uses Alice’s life as a starting point. What, if anything does this Yorkshire woman who fought for social justice and women’s rights in the 19th Century have in common with modern women? Both workshops are run as part of Morley Arts Festival and are pay-as-you-feel. 1-2 pm Visit me during my week as writer in residence to see how work on the show is progressing and have your say. I’ll be blogging a lot about Alice in the forthcoming months but if you want to be in the loop about all that is Alice related, please send an email to beckycherriman@googlemail.com and I’ll add you to the list. We also have a Facebook page. If the costumes turn out anything like the photos in this blog the audience are in for a real treat. On a separate issue given how radical Alice often was, I wonder what she would make of this daily insistence that the Labour Party need to find the centre ground? Is there no need or no courage for anything politically radical? Where’s today’s Alice. Glad you enjoyed the images. ‘Where is today’s Alice?’ is a question I’m looking to explore in the writing. It sounds like a fantastic day on Tuesday and a chance to delve into local history. I love the idea of Alice being brought to life and vividly remember your poem inspired by her. It was Caroline – more about this in a blog later today. I only hope I can do justice to Alice in this show.